With us, your son will be inspired! 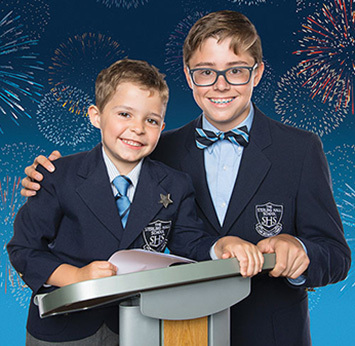 The Sterling Hall School is an independent day school for boys in JK-Grade 8. We have created a unique and supportive community where boys are encouraged to pursue their individual strengths and passions as they grow and develop through their formative years. Our curriculum emphasizes foundational skills and enriching co-curricular opportunities in an environment that fosters success. At SHS, we teach boys in the way that they learn best: through hands-on, activity-based learning, in small classes with plenty of individual attention. We encourage you to book a tour and visit the school to see us in action. Our Admissions Team is always here to personally answer any questions you may have. Call SHS at 416.785.3410 or email us at admissions@sterlinghall.com.